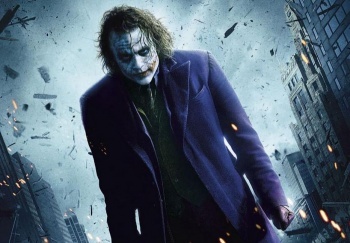 Christopher Nolan has denied rumors that Heath Ledger will make an appearance in his third Batman film. A recent rumor said that Christoper Nolan planned to feature Heath Ledger in Dark Knight Rises, his third and final Batman film, but this has turned out to be false. Nolan himself told the Hollywood Reporter that it simply isn't going to happen. The rumor, which came from a "source close to Nolan," said that the director was going to pay homage to Heath Ledger's performance as the Joker in Rises by cutting together already filmed scenes of the deceased actor and enhancing them with CGI. The source did say that it was only going to be a "fleeting moment," but apparently that moment was just a fabrication. In a chat with HR's Heat Vision, Nolan and wife/producing partner Emma Thomas said they'd heard of the rumor, and that they're "not doing that." They denied any appearance by Ledger in Rises, and said that the movie's script isn't even finished yet. Ultimately, Nolan is sticking to his earlier assertion that Ledger's portrayal of the Joker should be contained to The Dark Knight. Though it would have been interesting to see how Nolan incorporated footage of Ledger into Dark Knight Rises in the described way, which didn't sound all that disrespectful, it's totally understandable to want the film to stand alone. Not only that, but if Nolan was uncomfortable even talking about Ledger previously, I don't know how he would be able to cut together footage of him and enhance it with CGI. It seems like an unnecessary proposition when Nolan wants to move on to new possibilities.